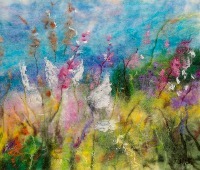 I am a Contemporary Felt Artist living and working in the Midlands. 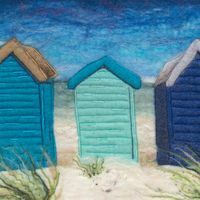 I create vibrantly colourful textile pictures, hand crafted using traditional felting techniques, combined with free machine embroidery and hand stitching. 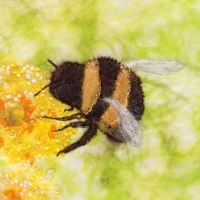 In my pictures I use a combination of wet felting, needle felting, free machine embroidery and hand embroidery to create impressionist style paintings. 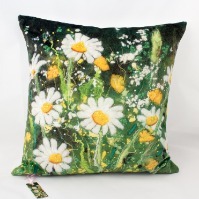 The main fibre I use is merino wool tops, but I also include Angelina fibres, mulberry silk noil, mulberry silk, wool nepps and bamboo tops to give added shine, sparkle and texture. The ethos in my art is to offer people something “to make their lives bigger, better and brighter, something to take their minds off their troubles in life" (Alfred East 1911).